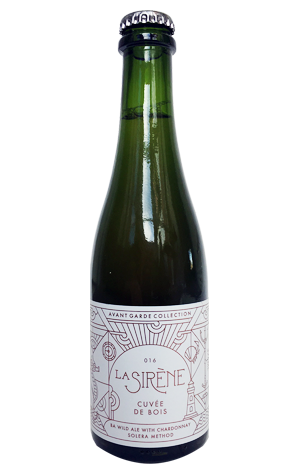 The final Avant Garde limited release of 2017 from Melbourne's urban farmhouse brewer La Sirène is another highlighting the direction founder Costa Nikias is keen to follow – and another that's been quite some time in the making. It's a blend of three separate beers: the original Cuvée and two older, barrel fermented saisons. The former started out as an open fermented farmhouse ale that was co-fermented with chardonnay grapes from Coldstream in the Yarra Valley and left to naturally sour. The latter two were saisons that had been aged on chardonnay lees in barrels since 2013 and 2014 respectively. Once blended, the beer then underwent a further eight months conditioning in bottles to allow it to mature and carbonate with flora indigenous to the brewery. So, what of the result of this lengthy and complex process? Well, for a start, it's the second beer to come with a couple of new additions on the rear label. There's a suggested temperature for cellaring (15C in this case) plus a simple guide to its qualities. Here, however, rather than the hops and malt or sweet/bitter, light/dark examples found relatively often these days, the characteristics are FUNK (three out of six), SOUR (four) and OAK (a full house). It's a fun way of both letting drinkers know what they're getting into and offering a spot of approachable education around what Costa calls the "truest expression of making beer like wine". As for the liquid, let's just say it's not a beer with which you're likely to try to introduce someone to sour beer styles for the first time. Get past the intensely fruity nose – chardonnay grapes and what Costa reckons is green pineapple and papaya skin – and you're met with an acidity that moves beyond bracing into territory you might label aggressive; its gueuze like drying qualities have the same effect on your palate a machete wielding ghoul has on the colour in the cheeks of a terrified slasher movie heroine. That's before a fresh wave of intense fruit rushes in (like the nerdy guy with a crush on the heroine who had been left for dead in a cupboard half an hour earlier). Add in elements reminiscent of Botrytis wines and Rodenbach's sweet acidity – not to mention the prominent oak – and you have a beer to get lost in. NB: not all of the liquid in the old barrels was used; they've been topped up, Solera style, to live another day.